Solar Impulse 2, piloted by Andre Borschberg, has taken off for a six-day flight over the Pacific Ocean. It left the ground on Sunday in eastern China, heading for the US island of Hawaii. The plane’s cockpit and controls can be used by just one person at a time, so Mr Borschberg and his Swiss colleague Bertrand Piccard have been alternating turns. Mr Piccard told reporters on the weekend that the endurance test would highlight what can be done with solar power. “I would like to demonstrate that we can do incredible things with clean technologies and renewable energies,” he said. The 8,500 kilometre jaunt across the Pacific is expected to take about 130 hours. It is the seventh and longest stretch of the maiden solar-powered global circumnavigation, which began in Abu Dhabi in March and is expected to cover a total flight time of around 25 days. The conditions on Solar Impulse 2 are pretty crude compared to the luxuries of modern transnational flight, with the two pilots experiencing altitudes of 28,000 feet and temperature changes of 55 degrees Celsius in the unpressurised, unheated cockpit. The plane is powered by over 17,000 solar cells built 72-metre wide wings; longer than those of a Boeing 747. 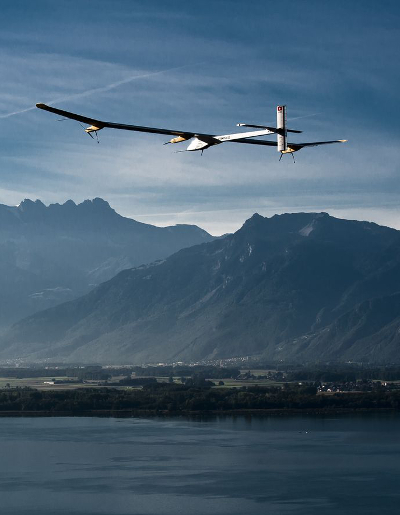 Its predecessor, the original Solar Impulse, notched up a 26-hour flight in 2010, proving its ability to power itself during the day and keep flying at night.